Zojirushi 20-Cup (Uncooked) Commercial Rice Cooker and Warmer. Brand New in Original Packaging. 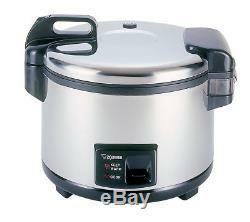 20-cup large rice cooker with automatic keep warm. Nonstick inner cooking pan with rinse-free rice water measure line. Detachable and washable inner lid. The NSF certified Commercial Rice Cooker & Warmer cooks up to 20 cups of rice. The unit automatically goes into keep warm mode after cooking, features durable stainless steel exterior and comes with an extra large rice spatula. What's in the Box. Capacity - 20 cups / 3.6 liters. Dimensions (W x D x H) - 17-3/8 x 15-1/4 x 13-1/2 inches. F There are product categories which are not returnable due to hygienic or sanitary as required by manufacturers. In an event where there is an error regarding a price error or description, we will notify you ASAP. Items removed from their'blister-pack' display packaging are non-refundable. The item "Zojirushi NYC-36 20-Cup Commercial Rice Cooker and Warmer, Stainless Steel" is in sale since Monday, August 8, 2016. This item is in the category "Home & Garden\Kitchen, Dining & Bar\Small Kitchen Appliances\Slow Cookers & Pressure Cookers". The seller is "asavings" and is located in Brooklyn, New York. This item can be shipped to United States, Canada, United Kingdom, Denmark, Romania, Slovakia, Bulgaria, Czech republic, Finland, Hungary, Latvia, Lithuania, Malta, Estonia, Australia, Greece, Portugal, Cyprus, Slovenia, Japan, China, Sweden, South Korea, Indonesia, Taiwan, South africa, Thailand, Belgium, France, Hong Kong, Ireland, Netherlands, Poland, Spain, Italy, Germany, Austria, Bahamas, Israel, Mexico, New Zealand, Philippines, Singapore, Switzerland, Norway, Saudi arabia, Ukraine, United arab emirates, Qatar, Kuwait, Bahrain, Croatia, Brazil, Chile, Colombia, Costa rica, Panama, Trinidad and tobago, Guatemala, Honduras, Jamaica, Viet nam.